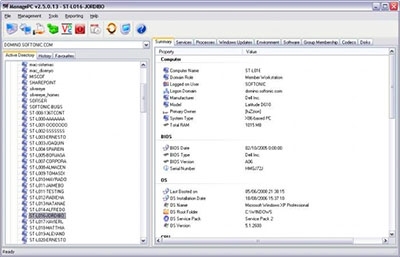 ManagePC is an open source application for PC management in Windows environments. Using ManagePC you can inventory all aspects of PCs on your domain including:Hardware, Services, Software, Hot-Fixes, Processes, Local Users and Groups, Group Policies, Codecs and much more. Manage PC also lets you take control of PCs through familiar interfaces. Use remote desktop, VNC, reboot, start/stop services, uninstall software and more directly from the ManagePC interface.